One is obligated to make the bracha of Kiddish Levana which begins Baruch Atta Hashem... Asher BeMaamaro Bara Shechakim. The bracha is made while standing. The bracha is made immediately upon seeing the moon and during the bracha and afterwards some say that one shouldn't look at the moon. For the Ashkenazic text click here (from Tefilah.org). For the Sephardic text click here (from Tefilah.org). During the month of Tishrei, Kiddish Levana isn't said prior to Yom Kippur. Rather it should be said right after Yom Kippur. Women are exempt from Birkat HaLevanah. Even though Ashkenazic women usually are permitted to volunteer to make a bracha even when they are exempt, the minhag is that they don't say Birkat HaLevanah. Others argue that they should really recite it. ↑ Why did Chazal choose to make this Bracha on the moon specifically? Aruch HaShulchan 426:2 explains that since the moon is the closest to Earth we are able to recognize Hashem’s control over nature easily. Also, the moon is compared to Bnei Yisrael; just as the moon doesn’t have any of its own light, so too Bnei Yisrael are only sustained through Hashem and his Torah; just as the moon gets smaller and bigger, so too Bnei Yisrael are always renewed. ↑ Shulchan Aruch 426:4 writes that one shouldn’t say Birkat Halevana until 7 days have passed from the molad based on the Shaarei Orah. However, the Bach 426 rules like the Rabbenu Yonah who says that one may say it after 3 days. Taz 426:3, Magen Avraham 426:13, Aruch HaShulchan 426:13, and Mishna Brurah 426:20 agree with the Bach. Sh”t Yabia Omer 6:38(1) rules like Shulchan Aruch but adds that if Motzei Shabbat is a few hours less than 7 days one may say it and in places where majority of the month is cloudy one may say it after 3 days. Mishna Brurah 426:17 clarifies that for this halacha days are counted as 24 hour periods and not from sunset to sunset. ↑ Masechet Sofrim 19:10 (in some versions 20:1) writes that one should say Birkat HaLevana specifically on Motzei Shabbat. However, Rabbenu Yonah (Brachot 21a) quotes some who say this, rejects it, and concludes that one can say it anytime after 3 days. Bet Yosef 426:2 writes that probably Rabbenu Yonah didn’t have this girsa in Maasechet Sofrim. S”A 426:2 rules that one should say Birkat HaLevana on Motzei Shabbat. However, the Biur HaGra 426:2 cites the Gemara Yevamot 39a which says that we don’t delay performing Mitzvot. The Mishna Brurah 426:20 rules that it’s proper to wait until Motzei Shabbat but there is what to rely on to say it earlier and in the winter and rainy months those who are zealous to say it early are praiseworthy. Rama 426:2 writes that if Motzei Shabbat is the 11th night from the molad one doesn’t have to wait until Motzei Shabbat because it’s possible it will be cloudy the following 4 nights. Halichot Shlomo (Tefillah ch. 15, n. 22) records Rav Shlomo Zalman's minhag to recite Kiddush Levana after 3 full days even during the months of Tishrei and Av. See Aruch Hashulchan 551:22 and Maaseh Rav 159. ↑ Shulchan Aruch 426:3 rules like the opinion of Nehardai in Gemara Sanhedrin 41b who say that one has 15 complete days. However, the Rama 426:3 writes that one may only say it up to half of 29 days, 12 hours, and 793 chalakim. Beiur Halacha s.v. VeLo writes that if one is in such a situation where half of 29 days, 12 hours, 793 chalakim passed and 15 days have not, there is what to rely on to say the Bracha. Beiur Halacha adds that if it’s the 16th day one should say it without Shem UMalchut. Sh”t Yabia Omer 6:38 agrees with the Beiur Halacha that on the 16th day one should say it without Shem UMalchut. ↑ Rambam (Kiddush HaChodesh 6:3) writes that from one Molad (the astronomical time when the new moon can be seen) to another is 29 days, 12 hours, and 793 chelakim (and there's 1080 chelakim in an hour). The Rambam 6:8 also writes that the time with which to begin to calculate the Molads from the beginning of creation is the 2nd day, 5 hours, and 204 chelakim. To calculate the Molad of Rosh Chodesh Tishrei 5773, first let us calculate the number of months which passed from creation and then add the appropriate time for each month. 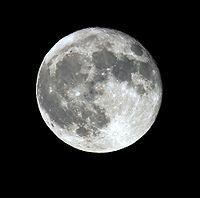 Although there are 12 months in a regular year because there are 7 leap years in a 19 year cycle, there is an average of 12.3684 lunar months a year. By Tishrei 5773, 5772 complete years have passed, meaning that 71390 complete months have passed since creation. The chelakim for the molad of Tishrei 5773 should be 1034 (i.e. 204 + (71390 * 793) modulo 1080) which is equal to 57 minutes and 8 chelakim. Making similar calculations leads to conclude that the Molad for Tishrei 5773 is 1am (i.e. 5+12*71390+(204+71930*793-1034)/1080) mod 24 starting from 6pm) Sunday (i.e. 2+1*71390+(909103-37879)/24 mod 7). The other months can then be calculated from that starting point by either adding or subtracting the interval for each month (1 day, 12 hours, 793 chelakim. To confirm these calculations, one can check the Chabad.org page of Molad times. ↑ The Rashba (responsa 4:48) quotes someone who said that it is forbidden to say birkat halevana on Friday night since it is like travelling out of the techum above ten tefachim. The Rashba doesn't understand that opinion. He argues that there is no techum above ten tefachim and also it is greeting Hashem and not the moon; therefore, it isn't at all like travelling out of the techum and is permissible to be recited on Shabbat. The Mishna Brurah 426:12 rules that it is permissible to say kiddush levana on Shabbat and Yom Tov if it is necessary. In the Shaar Hatziyun 426:12 he adds a reason that everyone can agree with; since it is a mitzvah filled with happiness a person might come to dance and it is forbidden to dance on Shabbat. ↑ Rama 426:4 writes that "we do not sanctify the moon under a roof." The Mishnah Brurah 426:21 explains that since sanctifying the moon is like greeting the presence of the Shechinah (Sanhedrin 42a), it is not honorable to stand under a roof, rather we exit from under the roof to the street just like we would to greet a flesh and blood king. However, both the Chazon Ish (Orchot Rabbenu v. 1 p. 178) and Rav Chaim Kanievsky (Ishei Yisrael 40:15) say that the main idea is to leave one's house or shul, but once one has done that he can certainly say kiddush levana under a tree or overhang. Shulchan Aruch 426:2 writes that one should look at the moon prior to making the Bracha. Magen Avraham 426:8 quotes the Shlah who says that one should only look once and then it’s forbidden to look again (for Kabbalistic reasons). Shaarei Knesset HaGedolah 426:5 quotes the Sefer Charedim that one may only look at the moon at the time of the Bracha. However, Shaarei Knesset HaGedolah writes that the minhag is look at the moon during the entire Seder and it’s supported by the language of Maasechet Sofrim quoted by the Tur and S”A. Birur Halacha (vol 5, pg 122) writes that if one is looking at the moon in order to recognize Hashem’s wonders then it’s permissible. Mishna Brurah 426:13 quotes these three opinions and doesn’t give a ruling. The Aruch HaShulchan 426:5 writes that the minhag is like the Shlah. The Ben Ish Chai (Vayikra(2) 23), Kaf HaChaim Palagi 35:4, Kaf HaChaim Sofer 426:34, Mekor Chaim 426:2, Chesed Alafim 426:4, Yosef Ometz 474, Chida in Moreh Etzbah 6:186, Birkat Eitan (Birkat Levana pg 207), Yalkut Yosef (Birkat Levana pg 146), and Ateret Paz (Birkat Levana pg 65) agree. Yerushalmi (Megillah 4:10) says that one shouldn’t say Amen Amen just like one shouldn’t say Shema Shema. This is quoted by the Ohel Moed (Kriyat Shema 1:7). Bet Yosef 61 writes that he doesn’t know what the source of the Ohel Moed is and challenges this because there are pesukim with the words Amen VeAmen. Pri Chadash 61:12 answers that in the pesukim it’s permitted if one pauses between the two words Amen. Korban HaEdah (Megillah 4:10) writes that in a congregation it’s forbidden but the pesukim were said in private and then it’s permitted. Kiseh Eliyahu 61:3 and Yabia Omer 10:5 agree. Yaavetz (Mor UKesiyah 61) argues that the Yershalmi is against the Bavli it is totally permissible to say Amen Amen. Yabia Omer 10:5 concludes that when saying Amen Amen Amen in Birkat Halevana one should pause between each Amen. This is also the ruling of Kaf HaChaim 61:43. This page was last edited on 30 May 2017, at 10:35.